It seems weird that I'm posting a first day of school post in the middle of March but William started preschool (or "pretty school" as he calls it) this week and it has been so great for all of us! He gets to learn, have fun and play with other children. Fritz gets to nap in peace and have Mom all to himself for an hour and play with the toys that William doesn't share. And I get to have an entire hour and a half while the baby naps to get stuff done at home. I've been wanting to get him into preschool for a while now but it was so expensive in San Diego and William wasn't potty trained (which really helped me get that whole thing into gear when I found out that was a requirement). Now that we live in Arizona, I'm thrilled that I found a little preschool at a nice lady's house that has 7 other children in his class, is a really great price and William LOVES it! They asked the parents to make a picture page of their child to put in a class notebook that they would use to do a monthly spotlight. 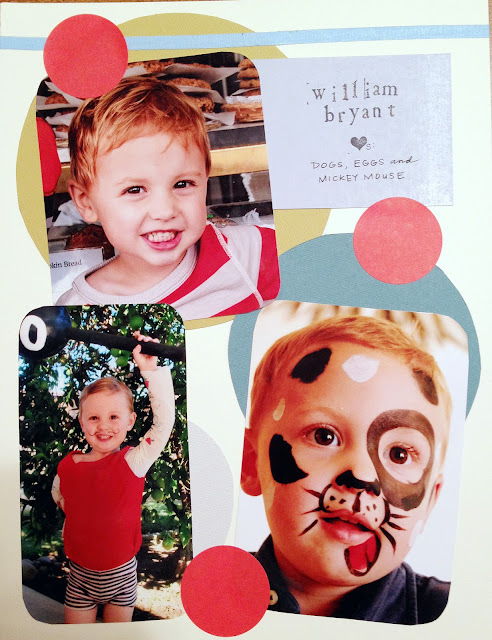 William helped me choose the pictures to go on the page and I even let him glue them on (I am not that controlling). He insisted on putting on the dog picture and couldn't wait to show everyone. When we visited the school a couple of weeks ago William loved it so I signed up right away. We had to wait a whole week for him to start because of spring break and he asked me every day when he could "go on the bus to school". Ha! Poor kid was pretty disappointed when he found out it was just me driving him there. The morning of his first day he woke up and was sooo excited. All morning long he asked, "We go to preschool now?" and I would tell him, "after breakfast", "after I take a shower", "after I change the baby's diaper" and he would do a little jig and giggle. It was adorable. I tried to take a picture of him before we left home but he was too excited to stand still for a picture so we took this one in front of school. He looks incredibly unthrilled but this is typical William. He is well-behaved but cautious and soft spoken. He had no trouble with me leaving him there even though he knew no one. I kissed him goodbye and off he went. Still not smiling but I know he was bursting with excitement inside. The first day was show and tell day so he, of course, brought one of his favorite stuffed dogs to show everyone. He also picked out his favorite dog shirt and really wanted to wear his dog backpack (P.S. haha about what what I wrote about potty-training in that post) but he has a preschool bag supplied by the school for him to use. When I picked him up from school he was dying to show me the Easter egg he had painted and his homework and tell me all about how he showed the funny dog picture to all the boys in his class and on and on. I've never heard him talk so much in all my life. Then he came home and took a two hour nap. This hasn't happened in MONTHS people. He insisted on taping his Easter egg on the fridge and loves to look at it every day. Preschool is the best thing that has happened to me lately. This is so great! It's wonderful to see them truly loving new experiences and learning! I'm so glad that he got into Ms. Lori's preschool! She is amazing and William looks so excited! !